Let us keep you updated on what’s happening at Blades this Spring. I don’t know about everyone else but I will be glad to see the end of Winter, and as we come out of another cold and miserable period, why not kick start the rest of the year with an outing to Blades and attend one of our upcoming Events for a little Spring cheer. Always wanted an Everhot warming your kitchen? Then our Everhot Sales Demonstration will be right up your street. Come and see the Everhot in action, as David Pengelly demonstrates all the potential the Everhot has to offer. There will be Free Delivery on any orders placed at the time of the Event, making this a great time to buy your dream cooker. New In - Sophie Allport Textile Spring Ranges Now Available! Why not bring a bit of colour this Spring to your kitchen with Sophie Allport Textiles! If you’re looking for kitchen textiles with a quirky country design then the Sophie Allport collection is just what you are looking for and will add a touch of warm and friendly charm to any kitchen. Easter Masterclass Demonstration With Richard Maggs the AGA Doctor! 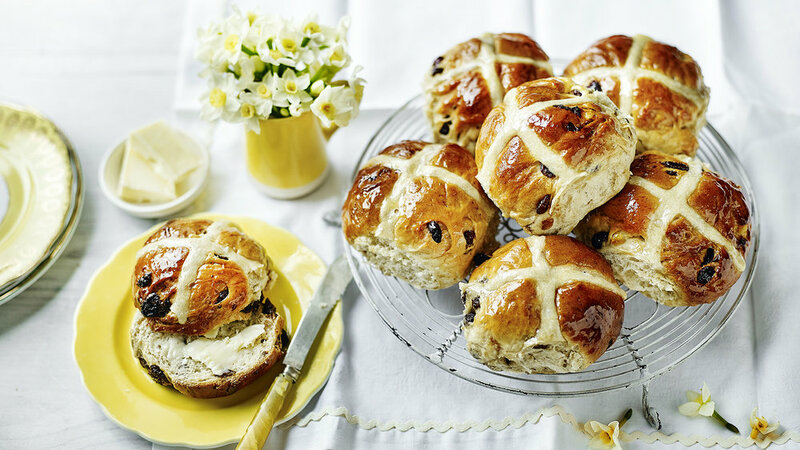 Got those extra special Easter plans this Spring, like lots of hungry guests visiting or just looking forward to that perfect Sunday Easter Roast or Hot Cross Bun…. Then join us at our Masterclass Demonstration hosted at our showroom in Oxted, Surrey and learn every thing you need to know about cooking on your AGA this Easter, plus the demonstration are always a fun outing to get you into the spirit with the advantage of trying the amazing food prepared during the Event. Little extra - 10% off cookware at any demonstration! 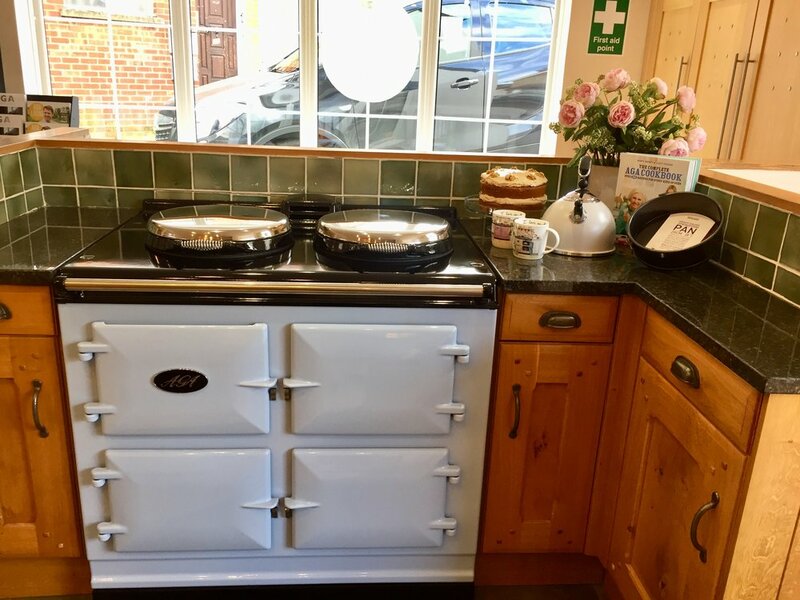 Why not pop in over the lead up to Easter this Spring and join us for a cup of coffee and something sweet hot out of our Showroom AGA as you browse the appliances and cookware we have to offer! It’s that time of year where we are all starting to get into the festive spirit. We would never admit it but we tend to get a little stressed, we all go around with this air of Christmas joy but underneath we are all thinking I have got so much to organise. So let us help you step away from all the stress and and enjoy a little Christmas spirit. 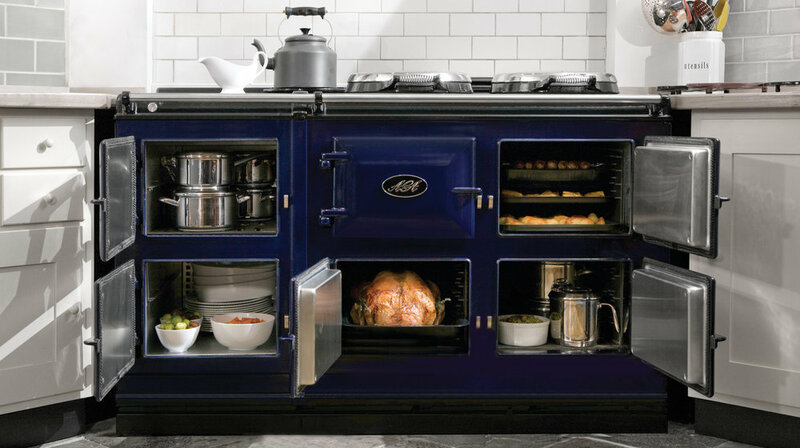 We have a number of Events coming up that will help any AGA owner with the Christmas chaos. Why not have a day away from the Christmas chaos and visit our stand at the Ardingly Winter Fair on the 24th & 25th November. With a host of festive stands and treats, this surely will be a great day out for everyone. Hosted in our Oxted Showroom, AGA Demonstrations are the perfect way to make sure cooking on you AGA this Christmas is effortless. Enjoy festive drinks as you learn all you need to know to cook the perfect Christmas Roast and some special extras. For available dates, please visit our Event & Demonstration page. Looking for the perfect gift this Christmas…. Then look no further than our range of Christmas cookware and textiles (if you want be extra kind this Christmas, say you care with a New AGA for someone special). Make Christmas entertaining simple with AGA Portmeirion Ovenware, ranging from Pie Dishes to Roasting Dishes, as well as matching Cake Stands & Cafertiere showcased above. Plus many other great gift ideas. We have recently added Sophie Allport’s Range of textiles to our showroom. Her fabric collection includes practical Oven Gloves and Tea Towels as well as any AGA owners favourite Hob Covers, all in beautiful designs. Why not pop in and have a browse. Throughout December we will have mince pies and mulled wine available when you visit our showroom. For customers needing a little break from the chaos that’s Christmas. Have you grown up with an AGA or always wanted one in your kitchen but can't quite afford one (like me). Well your problems have been solved by the AGA60. I have lived with an AGA all my life and wouldn't want anything else, it's a way of life and one I will not be giving up when I move out of my family home (yes I still live at home) the only problem is the cost. Now I know an AGA can be expensive but they are worth it, saying this, not everyone always has a large amount of money to spend. This is where the AGA 60 can be the solution. The AGA60 is an AGA in mini form, it can do anything a 3 or 5 oven can do but is half the size and price. You could almost say it's the new 2 Oven AGA. With its flexible 2 ovens, you have the choose of Roasting, Baking and Simmering, with the Hotplate and Simmering plate in one which makes the AGA60 "Small but Mighty". The AGA60 should be on any new home owners must have list, I even know what colour I would choose - Linen! Plus it's economical with its lower purchase and running costs. Back in Spring I got the chance to have a go at baking an Easter Simnel Cake on our showroom AGA60 and have fallen in love. Baking the cake was a doddle, it's just like cooking on any of the larger AGAs. This little cooker will bring all the nostalgic feelings of growing up with an AGA back for anyone but still keeping the AGA in the 21st century and all in your kitchen.
" I love the compact look"
" Best of both worlds - Oven flexibility but still keeping all the AGA charm"
" Easy to install and can fit into every kitchen"
My dad can't cook, it's official everyone agrees but him. The thing is I'm a little bit (and I mean a little) of a control freak when it come's to cooking in our house but I've given in to letting him being in control of the BBQ. But I always have a backup plan with the side dishes I serve when dad's cooking , I have to as there should be a hazard warning when it comes to his cooking (burnt on the outside and raw in the middle) on the BBQ. My first "go to" is Bacon & Toasted Hazelnut Salad, which can all be prepared in the AGA roasting oven. It's easy, all I do is toast a bag of blanched hazelnut at the top of the oven in a half size roasting tin (the AGA trays are best for this as they can run on the top runner in the oven) and at the same time cooked bacon lardons on the floor of the oven in my sauté pan with removable handle. To finish, place a bag of pea shoots on a large serving dish and sprinkle over a packet of dolcelatte cheese, the bacon lardons, the hazelnut which I have crushed up. Then I just drizzle with honey, balsamic glaze and lemon juice. My second "go to" salad is Warm Mediterranean Vegetables with Goats Cheese, which is as simple as pie. I normally just chop up the vegetables (red onions, courgette, peepers, tomatoes) and toss them in olive oil. I then get the AGA Oven Floor Griddle (I use this for every thing!) nice and hot on the floor of Roasting Oven, then place all the vegetables on top and grill them all in the oven. Once cooked I drizzle over pesto and sprinkled over goats cheese, basil, and toasted pine nuts. I even serve the salad on the griddle, it looks great when you bring it out with everything sizzling. AGA's Rule at Baking Cakes! The AGA has this magical oven called The Baking Oven and with this you can't go wrong when baking a cake. Due to the AGA's radiant heat the Baking Oven is able to cook any cake to perfection, this is because of the AGA's gentle heat from the cast iron compared to the fierce heat from an conventional oven. The Baking Oven is so versatile it's not just for baking! In our showroom we always have a a cake on the go for customers visiting us, and this week it's coffee and walnut, which I don't think is going to last long! as our staff have already got their eye on it for afternoon tea. Then simply mix all together and separate into two 8" cake tins. Then the AGA comes into it own with the the baking oven, You just place the cakes on the second shelf up in the Baking Oven and cook until the cake springs back when pressed lightly. There is no need to keep checking the cake or turning it, the AGA will cook the cakes perfectly evenly, while you whip up the icing out of 250g soft salted butter, 500g icing sugar, and 3tsp of instant coffee dissolved in a small amount of water, whisked all together until light and fluffy. Once the cakes are cooled, fill with half the icing and use the other half for the topping and decorated with walnuts. Cakes are always made easy with an AGA, and I would like to point out, 2 minutes after taking pictures of the cake it was nearly half gone thanks to everyone in the office, looks like we are going to need another cake baked on the showroom AGA for tomorrows tea break at Blades. When it comes to cooking I don't always want to use every pan in the kitchen, but if there is one pan I will always use it's my large AGA saute pan. It was my thank you present for designing Blades Heating's new website and I think I got the better end of the bargain. 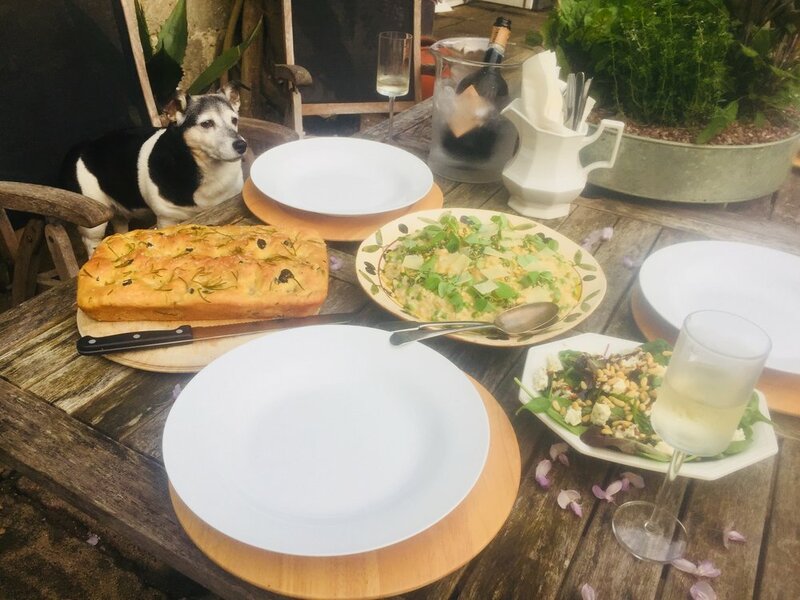 On Thursday it's family night in our house, after work we like to relax in the garden with a glass of wine and have a catch up. The only problem is I have one glass of wine, then I'm not in the mood to cook (plus I end up left in the kitchen cooking dinner by myself). This is when I love a one pan meal and last week is was my summer asparagus and pea risotto. Now normally with a risotto you have to stand over it and keep stirring as it cooks. But not with a AGA and the AGA saute pan on my side. All I had to do was heat butter and oil in my 28cm saute pan on the simmering plate and add 2 finely chopped shallots and 1 garlic clove and let it soften, the pan is extremely non-sick. Once softened I added 225g of risotto rice, which I cooked for a few minutes in the butter. Then I poured over a glass of white wine (this is operational) and reduce. Once the alcohol was burnt off I added 600ml vegetable stock and stirred. Now comes the easy part, I just placed a lid on top and transferred to the simmering oven and sat down to relax. This is why I recommend the AGA saute pan as the handle is detachable. After 10 minutes I removed the pan from the oven (without burning myself thanks to the removable handle) and added chopped asparagus and peas. The lid went back on and the pan was returned to the oven. Then I sat back down in the garden with my wine for a further 10 minutes. Life is made easy with AGA's saute pan. At Blades we have an extra special sales assistant, she doesn't do much other than beg for food and sleep in front of the showroom AGA's. If you haven't guessed yet, this special assistant is my dog Duffel. She comes in to work with me sometimes (because she will not be left on her own ever!) and keeps the staff at Blades entertained. She loves nothing more than going upstairs to the office and seeing if she can persuade someone to share their food (Collin and Mark are normally the weakest links and give in). But she is most keen to sleep all day, and this is where the AGA Dog bed is of great use. When she started coming to work, We were having to keep lugging her dog bed out of the car every time so she could have somewhere to sleep. Then, when AGA brought out the Hare Textile range, it included Dog Beds (AGA dog beds also come in other styles), I ordered one straight away for Duffel to use in the showroom and haven't looked back. It's great for the showroom, Duffel can work hard by modelling how brilliant it is sleeping in it all day, and customers think she is so sweet all snuggled up in her dog bed by the AGA. To be honest, the only time she will leave it is for food. I have to pull it across the floor to move her, which is easy as it so light. Plus if she gets it dirty, all I have to do is wipe it clean. I have to say this happens a lot as she's so short and her tummy is getting bigger, therefore lower to the ground and closer to the mud. Word has got around that when Blades Heating Limited, an independent AGA showroom in Oxted, employed me as their new Showroom Manager, they also got a food loving cook included in the deal. I've been here for a year now and the staff are starting to gain weight. I'm not saying it's my fault but everyone else blames me. Working at Blades has made me aware that most of you want to sometimes rustle up something without any fuss but still looks like you've made an effort. We all do, it's just part of life and your AGA can help you with this. For instance this weekend my mother has nominated me to sort out dessert for a dinner party (but my week is getting away from me with trying to buy a car as mine has blown up, on top of my busy life like everyone else) and this is where an easy pavlova comes in. I don't think I've ever found anyone who doesn't like a good pavlova, and it will be a great desert at the moment with the little bit of warmer weather that we are enjoying for now. This is something that you can make and forget about until later, or in my case I made mine on one of our showroom AGA's in my lunch break, a girl has got to multitask. It's all very simple, I separated 6 egg whites and placed them in a clean grease free bowl to whisked until stiff and then gradually whisked in 350g sugar a tablespoon at a time. Then to finish, I whisked in 2 teaspoons of white wine vinegar and cornflour. Ok, so next is where your AGA and the AGA cookware come in handy and makes life easier. Using an AGA cold plain shelf (every AGA owner should have one, they have an endless number of uses and I always recommend them to our customers) or you can use a large AGA baking tray, I lined the cold plain shelf with Bake-O-Glide that's a must have for an AGA owner. I placed the glossy mixture on top of the Bake-O-Glide in a circle shape with the side a little higher in order to keep the topping in place later. It doesn't need to be perfect, that's part of the charm. Then I simply place the pavlova into the simmering oven and let it do its thing. I check mine after 3 hours and 30 minutes by seeing if it would peel away from the Bake-O-Glide, it can take longer. Once cooked, I let it slowly cool down by the AGA. Once cooled I finished with 500ml double cream whipped with 50g icing sugar and 3-4tbsp elderflower cordial folded in, and the topping of my choice (my favourite is strawberries and raspberries). Then I simply enjoy the fruits of my labour, and pretend I've slaved away in the kitchen but in truth the AGA did all the hard work. P.S Should it all go to pot, just mix with cream and fruit and make Eton Mess instead.